Oil on canvas painting by George Earl. A group of fashionable passengers are gathered on a platform at King''s Cross station, with their dogs, guns and sporting equipment, ready to catch a train to Scotland at the beginning of the game shooting season in August. Earl is best known as a sporting and animal painter, and was one of the few artists to set such elaborate narrative paintings in station interiors. 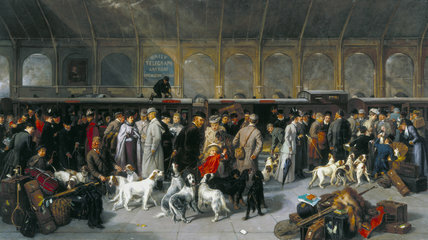 He painted several versions of this work including its companion painting, ''Going South'', showing the return to London. 'Going North, King's Cros Station', London, 1893.